Alison prepares to return to school even though her father wants to move away from Rosewood. However, she's upset that she must visit the doctor on police orders and asks Hanna to accompany her. Ali records her responses to help her friends keep up with the lies, and she adds another one to list when she obviously lies about a deep scar on her leg. Meanwhile, Mona prepares her army to scare off Alison even though Lucas and Paige don't seem as ready to take part in whatever plan she's devised. 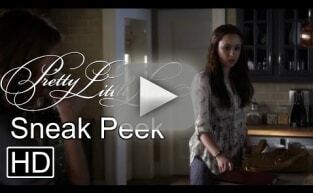 And Spencer finds out that her mother is just as worried about her father's possible involvement in Mrs. Di's death. Alison tells Spencer that her mother died because someone messed with her prescription medication, and Spencer thinks her father is in the clear. But then Spencer finds the same pills that killed Mrs. Di in her house prescribed to her father. People come and go so quickly around here. Shana gone, Ali back. One girl checks out and another one checks in. Hanna, you're not spontaneous. You make a Pinterest board before you change your nail polish. Permalink: Hanna, you're not spontaneous. You make a Pinterest board before you change your nail polish. 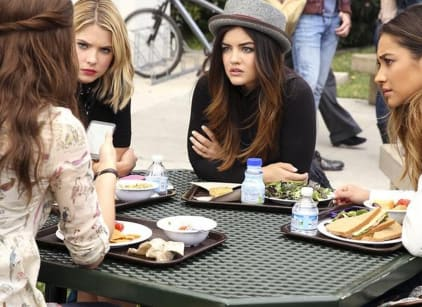 Pretty Little Liars Round Table: "Thrown for a Ride"
Pretty Little Liars Music: "Thrown From a Ride"
Pretty Little Liars Clip - She's a Secret Keeper!